Definition: The sag template is used for allocating the position and height of the supports correctly on the profile.The sag template decided the limitations of vertical and wind load. It also limits the minimum clearance angle between the sag and the ground for safety purpose. The sag template is usually made up of transparent celluloid, perplex, or sometimes cardboard. The following curves are marked on it. 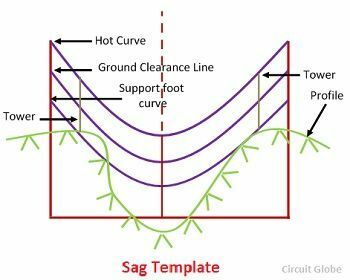 Hot Curve – The hot curve is obtained by plotting the sag at maximum temperature against span length. It shows where the supports must be located to maintain the prescribed ground clearance. Ground Clearance Curve – The clearance curve is below the hot curve. It is drawn parallel to the hot curve and at a vertical distance equal to the ground clearance as prescribed by the regulation for the given line. Support Foot Curve – This curve is drawn for locating the position of the supports for tower lines. It shows the height from the base of the standard support to the point of attachment of the lower conductor. For wood or concrete line, pole line this curve is not required to be drawn since they can be put in any convenient position. Cold Curve or Uplift Curve – Uplift curve is obtained by plotting the sag at a minimum temperature without wind price against span length. This curve is drawn to determine whether uplift of conductor occurs on any support. The uplift conductor may occur at low temperature when one support is much lower than either of the adjoining ones. The above-mentioned curves are first drawn on a squared on the same scale as the line profile. Suitable scales are selected. With the help of the sharp pointed probe, the curves are then transferred to transparent celluloid or perspex. The celluloid or Perspex is then cut along the line of maximum sag, i.e., the hot curve.